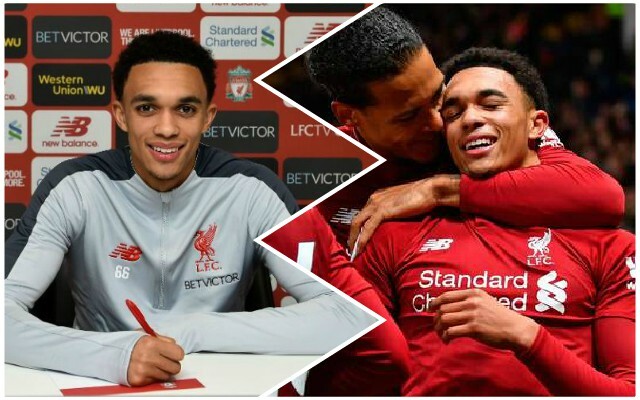 Trent Alexander-Arnold has signed an improved contract with Liverpool that should keep him at the club until at least 2024, it has been confirmed. News broke this morning that a new deal was in the pipeline, but it has already been completed, and both Trent and the boss are delighted. Trent told LiverpoolFC.com: “I’m ecstatic and really proud. I feel privileged to have the support and the trust the club has in me to offer me a new deal. Trent has played 67 times so far for the Reds, and there are definitely many more appearances to come. He’s already played at the World Cup and in a Champions League final – his ceiling is incredible. Jurgen Klopp challenged Reds fans to come up with a song for him in the wake of the news – and he’s right when he says he fully deserves one. It’s not easy to find words that rhyme with Alexander-Arnold, though! The contract news is exceptional for the whole club and will give everyone an additional lift heading into this afternoon’s match against Crystal Palace.